Tag Archive | "Don Winkley"
Along the course of this year’s Last Annual Vol State 500K I documented the 314+ mile journey on my Twitter and my Facebook ‘Running Page‘ (view here). Below is my race report along with a few of those Facebook updates and photos I took throughout the race (and others). The race report is very long and was done for me, to help me remember the race as time goes by and memories begin to fade. If others happen to enjoy it or benefit from it then that is even better. Last Annual Vol State Road Race. 314 miles – go as you please. It begins by riding the ferry in Hickman Kt across the Mississippi and depart in Missouri. We run 100 meters in Missouri and recross the Mississippi on the ferry. Then the race begins covering about 10 mile across the corner of Kentucky then NW to SE across TN, We leave the state near Nickajack Lake entering Alabama for about 4 miles before crossing into GA on a private ranch for just over 1 mile, The finish on a big rock at the edge of a 150 ft cliff overlooking TN…. Dorena Landing Missouri to Castle Rock Georgia. I got involved with a project to save a home I own in Corpus Christi, TX from demolition. The house had been damaged by a hurricane and after working on it for a couple of months I simply deserted the project for about 6 years. First and foremost was the need for a complete reroof. Soffit, fascia, drip strip had to be removed first, remove the layers of buildup roofing, put cripples on rafter ends, install stained redwood fascia with copper nails, paint new drip strip copper color, install drip strip, lay base layer of roll roofing, then final cover coat of roll roofing. About 4-5 hrs per day (12AM to 5PM) in the heat of Texas. The run training was pathetic, 6 miles each morning at 5:30 AM at such a slow pace. On Saturday and Sunday I ran 10-20 miles with friends at various paces depending. The drinking. I realized I was well on the way to being an alcoholic so about 3 weeks prior to Vol State I switched to non-alcoholic beer. Drank lots non-alcoholic beer, now I could start drinking when I got up at 4:30AM before the morning run. I had a really hard run the weekend before leaving for Vol State with a friend Clay Brieger who ran a 3:10 marathon just this past weekend. I pushed Clay as hard as I could in the heat that arrived that morning at sunrise. Somehow this gave me confidence to announce (only to a few running friends in Corpus Christi) that I was going for all the marbles in Tenn – redline it. If the temperatures were extremely hot during the race I announced “This is a race I think I can win”. Can’t ever remember making such a prediction before. I had run Vol State the prior three years in a row. For anyone with a memory you would know every turn, but you might also remember “it’s no cake walk”. I had never actually raced the race, my only experience reference racing Vol State was my war for 3rd place with Fred Davis last year. With about 80 miles to go, we raced about 30 hrs straight within sight of each other – I eventually broke Fred with only a couple of miles to go. It was my first experience in this race to run all night long. I started easy – running a comfortable pace that I anticipated I could hold for a number of hours. I have had so many 24hr, 48hr, 3day, 6day, 1000mile runs. The experience factor, my body is very aware of what is coming. I think the body actually looks forward to the long hours of running. The mind at times rebels but eventually tunes out. Donald Brown was my crew for the 4th year in a row. He is more into the race than I. He would like a live videocam with live GPS for each runner. 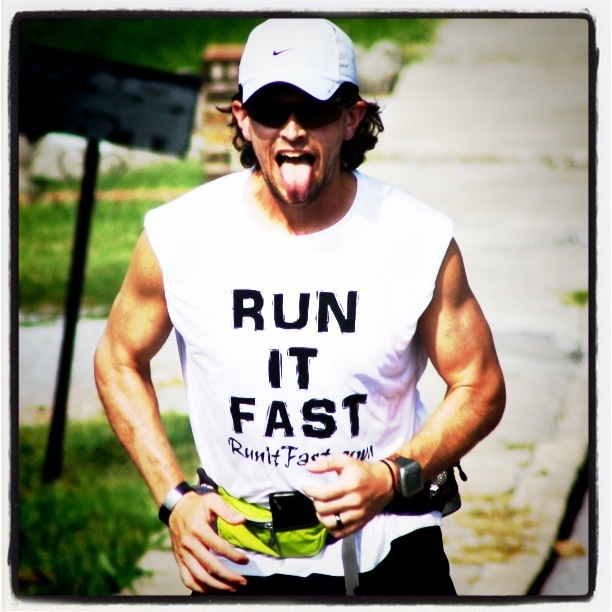 He wants to follow each runner step by step as they make the long trek across Tenn. He is simply crew EXTRONDINEER. After all our years together there is little need to give any instruction, Donald reminds me of sunscreen, bug spray, lube, helps tape my feet, knows my drink preferences – alternating protein, diet pepsi, pepsi, seamlessly. He also had the course memorized with little need to reference the maps. I had been silent reference my feelings that I might actually be able to win this race. While many predicted they would have a sub 5 day performances – I simply listened in silence. I remember Donald asking Carl what he felt my odds of wining were. No comment from Carl. Carl is like the co-race director, himself a hell of a runner. The first day, day became night and Donald said we had reservations at a hotel for the evening. I suggested that Donald cancel the reservation, I intended to run thru the night. My plans still being withheld even from my crew. When we finally got a room the next afternoon, Donald took in his computer and started to follow the race as he had done in prior years. We had taken hotels and stayed 8 hrs or more – time for me to watch Tour de France and for Donald to check up on e-mails ref the race and personal. We would leisurely go to hotel breakfasts, eating and talking. Don gets testy. Remember I had not disclosed even to Donald my plans to redline the race. Now there were new rules. I told Donald the days of following the race on the computer before I reached the finish were over. My ability to run was totally dependent upon my crew pulling the duty of his life. To run 20 hrs per day is no problem but for the crew 20 hrs is next to impossible. Donald would need all the sleep he could get. The orders from me were to take nothing into the hotel except for a clothing change, toothbrush – We could either win or Donald follow the race but not both. From then on Donald got his updates from Carl by phone. Actually he got some updates from Natalie his wife in France who would walk to a French internet café, check the Vol State web site and call Donald on the road. I took the lead after about 100 miles and seemed to ascend to the throne immediately – never mind there was 200 – actually 213 miles to go. In several multiday races of old I had been in last place for several days watching the early leaders fade and then going for the jugular. When the dust settled I was high up on the leader board, actually winning a Sri Chinmoy 10 day race years ago after being in last place early on. So I had little experience running in the lead. Actually running in the lead was not so hard – it was the expectation that I should or would hold the lead. Donald was paranoid that I was being caught. Donald and I had fallen into a rhythm. Running to the hotel mid day, taking a brief rest. I would eat on the run. I ran all night long and during the night Donald would drive 2 miles ahead and sleep. I would knock on the window when I arrived at the car. Donald would unlock the door, I would help myself to drink. He would drive ahead and catch another nap in the car. Our lead of 10-20 miles over 2nd place seemed relatively constant. Heat Fest – Dehydration – Sleep Deprivation. Was the Don Donald team about to be unglued? Donald had complained of headache in a prior day but this day it seemed he was in bad shape. The day was early and I had hoped to run a few more hours before the real heat began. I myself was not feeling well. For the first time we drove ahead to a hotel to get necessary rest. I couldn’t run a step without crew, my race/our race being totally dependent upon Donald and his ability to aid me. Thankfully this unscheduled rest revived both of us. Only 100 miles to go. I was reduced to about 2 miles per hr but started to run blocks of 10 miles then blocks of 6 miles punctuated by brief rests in the car under air-conditioning. Breaking the final miles into workable blocks of miles gave a mental image of reality. I could run 10 miles – but run 100 miles impossible. I have called what I did running, but I doubt any observer would say I was doing anything other than a power walk. I call it a waddle, developed over the many years of running really long distances. I remember when I could actually run some during my 1000 mile races. But those days – once running 72 miles/day for 14 days in 1997. But those days – are ancient history when dinosaurs dominated the landscape. I hoped to finish in the daylight but it was not to be. My final miles were extremely slow – the climb up sand mountain to the finish – all I could do was make slow step by step progress. We arrived at the rock – first – 5 days, 14 hrs, 21 min 32 seconds King Don/Donald – a comfortable margin over second place at 5 days, 21 hrs and change. I wish I had asked more questions of everyone. Laz, Carl are full of stories. In retrospect I always regret talking too much and listening too little. Everyone is and has a great story of how and why they have taken on this Rogue race flying under the radar. No entry form, no entry fee, no awards. What makes this race special is it’s about finishing, well actually starting the race must be very intimidating to a first timer. Anyone who steps off that ferry solo unaided. It’s unimaginable to me. To look at 314 miles of solitary running, day and night, only the sweep of Carl or Laz once per day. Perhaps the daily phone call to report your position. Where do you sleep, how do you find food, drink on those long stretches between towns, convenience stores closed at night? To the unsupported runner, this race should belong to you. My hats off!! I wish I could/would have stayed at the rock to see all finish. I had no injuries, no blisters, actually Donald popped one blister on my little toe but it was basically well by the finish. For me, I only want solitary down time after races of this distance. I only want to be alone and sleep. So I retreated into my shell, sleeping on Abi’s couch for hours watching Tour de France. Never the less I love and admire each and every finisher. I hope everyone writes a race report. Queen Juli – Winner of Vol State 2010. You served the thrown with class. You wrote, “Every once in a while, at work, at the fitness center, or on a run, I tell someone about you all on the roads of Tennessee. 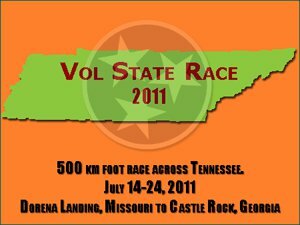 Here is a look at the full results from the 2011 ‘Last Annual Vol State 500K Foot Race’ that covered 314 miles through 5 states and the hot-oven that is the state of Tennessee. 73-year old Don Winkley, the Hemmingway of multi-day road racing, won the esteemed title of ‘King of the Road’ finishing the race in 5 days 14 hours 21 minutes and 32 seconds. Naresh Kumar was the first unaided runner (without crew) to cross the finish line with a time of 7 days 55 minutes and 4 seconds. 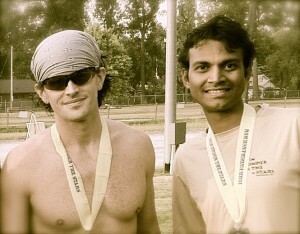 Naresh completed the brutal race wearing Vibram 5 Fingers the entire way. He came in 4th overall. Abi Meadows was the first woman to Castle Rock finishing with a time of 6 days 15 hours 45 minutes and 47 seconds. She finished third overall. Congrats to all the finishers and to those who started as well. This is a very tough race that takes a very special and determined person to even show up at the ferry for the start at Dorena Landing. 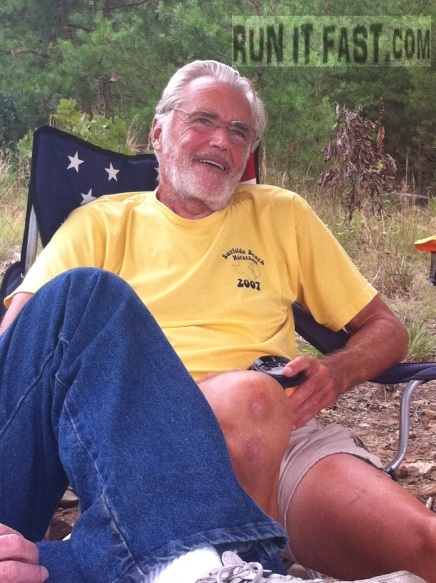 73-year old Don Winkley waddled his way to wining the 2011 Last Annual Vol State 500K with a time of 5 days, 14 hours, 21 min and 32 sec. The first uncrewed runner to finish the line was Naresh Kumar from India. Congrats to all of the starters and finishers of the 2011 Last Annual Vol State 500K. 2011 Vol State 500K Runners, Maps, Tracking, Etc. It’s time, once again, for one of the craziest ultra marathons in the United States to take place. 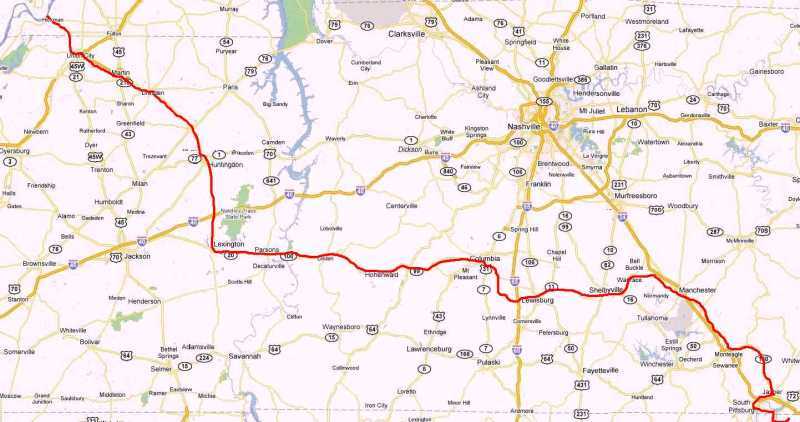 This race takes place in the middle of July, every summer, and covers most of the great state of Tennessee as it toasts most who decide to conquer it. HEAT INDEX READINGS… 105 TO 111 DEGREES SUNDAY AND MONDAY. * TIMING… PEAK HEAT INDEX READINGS ARE EXPECTED BETWEEN 11 AM AND 6 PM EACH DAY. LITTLE RELIEF IS EXPECTED AT NIGHT WITH OVERNIGHT LOWS IN THE MID 70S TO LOWER 80S. * IMPACTS… PROLONGED EXPOSURE TO THIS HEAT CAN BE DANGEROUS IF THE PROPER PRECAUTIONS ARE NOT TAKEN. A HEAT ADVISORY MEANS THAT A PERIOD OF HOT TEMPERATURES IS EXPECTED. TAKE EXTRA PRECAUTIONS IF YOU WORK OR SPEND TIME OUTSIDE. WHEN POSSIBLE… RESCHEDULE STRENUOUS ACTIVITIES TO EARLY MORNING OR EVENING. KNOW THE SIGNS AND SYMPTOMS OF HEAT EXHAUSTION AND HEAT STROKE. WEAR LIGHT WEIGHT AND LOOSE FITTING CLOTHING WHEN POSSIBLE AND DRINK PLENTY OF WATER. CHECK UP ON RELATIVES AND NEIGHBORS. TO REDUCE RISK DURING OUTDOOR WORK… THE OCCUPATIONAL SAFETY AND HEALTH ADMINISTRATION RECOMMENDS SCHEDULING FREQUENT REST BREAKS IN SHADED OR AIR CONDITIONED ENVIRONMENTS. ANYONE OVERCOME BY HEAT SHOULD BE MOVED TO A COOL AND SHADED LOCATION. HEAT STROKE IS AN EMERGENCY… CALL 911. The only thing more intimidating than the weather is the trash the VS500 veterans talk on the email threads regarding this race. A VS 500K record of 22 runners have signed up so far for the race this year. You can donate to Joshua and Naresh’s charity:water effort to raise $5,000 to build a water well to provide clean drinking water to a community of 250 people (Click HERE to Donate). Thanks to all of our friends and family that have donated so far in an effort to reach our goal. It means a lot that you’ve taken the effort to support us in this race and our vision of hopefully being able to build this clean drinking well.